A new report, published today by the London Joint Working Group on Substance Use and Hepatitis C (LJWG), shows the results of a successful four-month pilot project that offered hepatitis C (HCV) tests to people who use needle exchange services at nine community pharmacies across London. Public Health Minister Steve Brine MP gives support to pioneering project offering hepatitis C testing in pharmacies that offer needle exchange. Pilot offered tests to those at risk of exposure; half of those tested (53%) had hepatitis C antibodies and 78% of those who engaged with specialist services had hepatitis C viral particles detectable in their blood. More than half of people tested (57%) did not know that hepatitis C treatment is interferon-free. People are being treated and cured of hepatitis C as a result. The pilot project aimed to diagnose people with hepatitis C and refer them for potentially life-saving treatment. Pharmacists taking part in the pilot offered testing to people at risk of contracting the virus and found that 53% (95 out of 178) of participants tested positive for hepatitis C antibodies. The pilot also laid the groundwork for future extension of the project with a potential to offer treatment alongside testing, with 84% of participants reporting that they would like to receive any required treatment at their community pharmacy. Download the report as PDF here. 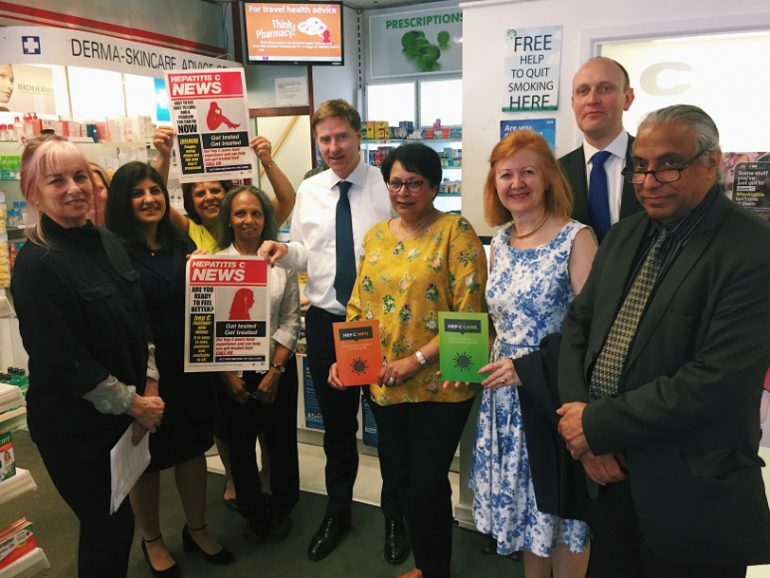 The Minister for Public Health and Primary Care, Steve Brine MP, joined leading members of the LJWG at Portmans Pharmacy, Pimlico, to highlight the success of a pioneering project offering hepatitis C testing and referral into treatment. 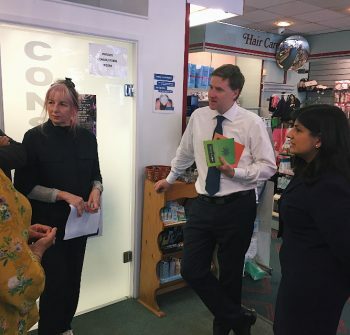 Minister Steve Brine MP with members of the LJWG team and pharmacy team at Portmans Pharmacy, Pimlico. The pilot also highlights the need for further hepatitis C awareness-raising efforts, with 57% of participants reporting that they did not know that hepatitis C treatment no longer requires difficult and lengthy interferon injections and can be treated with a course of tablet-based direct-acting antiviral medication. Hepatitis C is a blood-borne virus that, if untreated, can cause cirrhosis, liver cancer and liver failure. However, NICE-approved treatments can cure the virus in more than 95% of those infected. The public health challenge facing the UK is diagnosing people infected with hepatitis C and supporting them into treatment, as around half of people living with the virus are undiagnosed. People may live with the virus for many years without symptoms, or symptoms may be generic and hard to diagnose, such as achy limbs, exhaustion, ‘brain fog’ and depression. There are estimated to be 160,000 people living with hepatitis C in England, around half of whom are undiagnosed. Over a quarter of people living with hepatitis C (41,500) live in London. As hepatitis C is a blood borne virus, prevalence is high amongst people who inject drugs; according to Public Health England, around half of people who inject drugs in London have hepatitis C.
Dr Suman Verma, Consultant Hepatologist at Chelsea and Westminster Hospital and co-chair of the LJWG said: “We now have the treatments to eliminate hepatitis C as a serious public health concern in the UK. In order to do this, we must diagnose people who are infected and support them into treatment. “Offering free, accessible hepatitis C testing in community pharmacies is a more patient-centric way of engaging with a group of vulnerable, young people where hepatitis C prevalence and risk of transmission is high but, due to personal and social circumstances, engagement with community drugs services or healthcare services in general is poor and sporadic. Minister for Public Health and Primary Care, Steve Brine MP said: “We are working hard to eliminate hepatitis C as a public health issue by 2025, five years ahead of the World Health Organization target. For more details about the project, for interviews with people involved, or for more photos of the ministerial visit to Portmans, please contact: Jane Cox, Principle Consulting, 07779 595609, jane@principleconsulting.org.uk. About the LJWG: The London Joint Working Group on Substance Use and Hepatitis C (LJWG) is a group of expert clinicians and patient advocacy and voluntary sector leads, working in collaboration with a wide group of stakeholders with the common goal of implementing an integrated plan to drive improvements in the prevention, diagnosis, treatment and outcomes of hepatitis C in people who use drugs, and reduce the spread of the virus. The LJWG was formed in October 2009. As of 2016, the Committee has been co-chaired by Dr Emily Finch and Dr Suman Verma.